Shillong, January 21: Informing the Supreme Court on the latest development on rescue operation, Meghalaya government asserts that the state would not abandon the mission and continue their efforts. Almost more than a month, 15 miners are trapped inside an illegal rat-hole mine in Meghalaya’s East Jaintia Hills and the rescue mission continues in full swing. 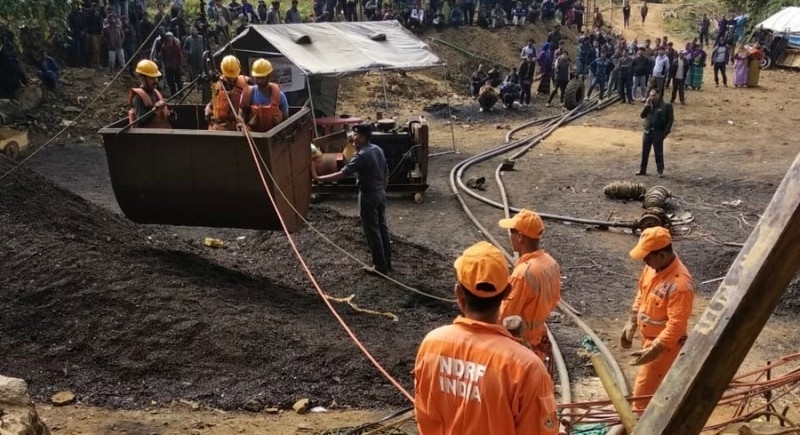 The operation to rescue the miners is carried on with enormous efforts by multi-agency operation, which includes NDRF officials, Odisha Fire Department, Indian Navy and other experts are involved in the rescue operations. A team of Indian divers, last week, had spotted the body of one of the 15 miners. The navy had suspended operations to retrieve the body. The body was detected at a depth of 160 feet and at a lateral distance of 210 feet in a rat-hole tunnel with the help of footage from an underwater remotely operated vehicle (ROV). However, the families of the trapped miners have been informed about the happenings and are called to identify the body. More than 200 rescuers from the NDRF, the Odisha Fire Service, Navy, State Disaster Response Fund, state Fire service, and others are involved in the rescue operations. Five miners managed to escape after the mine flooded and alerted the people about the tragedy at Ksan village, about 130 km from Shillong.